Plot summary : Hibiki and Asumu are on their way to a Makamou attack on the beach. Once they arrive there, they see dozens of people running from the massive Orochi, a beast rumored to be the strongest Makamou ever created. Once they arrive, Hibiki walks towards the Orochi and transforms, but all of his attacks prove useless against Orochi. The situation is made even more dire when Hibiki jumps in the way of an attack meant for Asumu. Taking the full force of the attack, Hibiki passes out as the Orochi swims away, leaving a panicking Asumu to get help. Hibiki ends up in the hospital and Asumu begins blaming himself for Hibiki's injuries. Feeling useless, he begins helping at Tachibana's, going through dozens of books to try and discover a way to defeat the Orochi. Upon coming across a book with his name on it, Asumu sits down and begins to read what turns out to be the history of Takeshi, the Oni and the Makamou war. 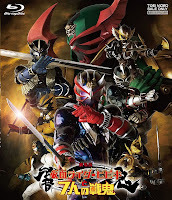 Plot summary : While in the middle of fighting, the Gekirangers and Mele are telported to Hongkong, along with Rio and various other martial artists around the world. Just as Rio and Jan were about to fight, they meet the mysterious Lao Fan before seeing others brought to the island as well. They all then meet Miranda, the secretary to Yang, a media mogul who brought them all together for the Kenkonitteki Martial Arts tournament to prove who's the strongest of them all. The first round of fighting leaves the Gekirangers, their Confrontation Beast-Fist rivals, Lao, Barnard Koyama, and Big the Goto as the winners. 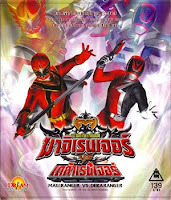 Plot summary : The DekaRangers respond to a disturbance in the city. On arriving, they find the area under attack from three coloured people. They fight them but they steal Machine Bull to chase a crow, which is apparently their enemy. They crash and are arrested by the DekaRangers. 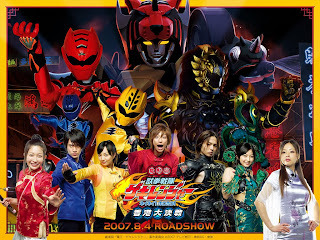 At DekaBase, the DekaRangers discover that their prisoners are Bakuryuu Sentai AbaRanger. Doggie learns that the crow is an Alienizer, Ginjifu Seijin Kazakku, who has been stalking the AbaRanger’s friend. After Yukito heals Doggie’s bad back, all the Rangers start looking for Kazakku. Meanwhile, Aburera is introduced to Trinoid #0, Saunaginnan who revives Reversia Seijin Succubus Hells and Speckion Seijin Jeaneio but runs out of power.